We decided to trial the Quartix Vehicle Tracking System in a representative sample of 40 of our vans. Zest Tracking Limited of Woodbridge facilitated this trial and were extremely efficient in ensuring initial installations were organised with the minimum of disruption and providing the necessary training and backup. The trial proved successful and we decided 6 months later to install Quartix tracking into the whole of our van and truck fleet – 176 vehicles to date – covering East Anglia and the West Midlands. We opted to purchase the equipment outright and utilise the Corporate package. As old vans are replaced with new vehicles, the de-installation and re-installation of the tracker units has been facilitated faultlessly by Zest Tracking. The trackers are very reliable, but where a rare problem has arisen, Quartix and Zest Tracking have been quick to advise on and remedy the issue. Any queries that arise in day-to-day use are dealt with efficiently by Zest Tracking. Apart from the obvious benefits of being able to know where your vehicles are in real time the reporting and data interrogation facilities have been invaluable, for instance, in aiding accident reporting; and this is a benefit that supports the driver as much as it keeps him honest. The Driving Style reports have a positive effect on the drivers. This was particularly noticeable at the outset with a considerable and subsequently sustained voluntary improvement in scores. Other operational benefits, including security, are evident. We appreciate from others the provision of service that we aspire to and Zest Tracking, in collaboration with Quartix, help us provide the service to our customers that we like to think is a cut above the rest. 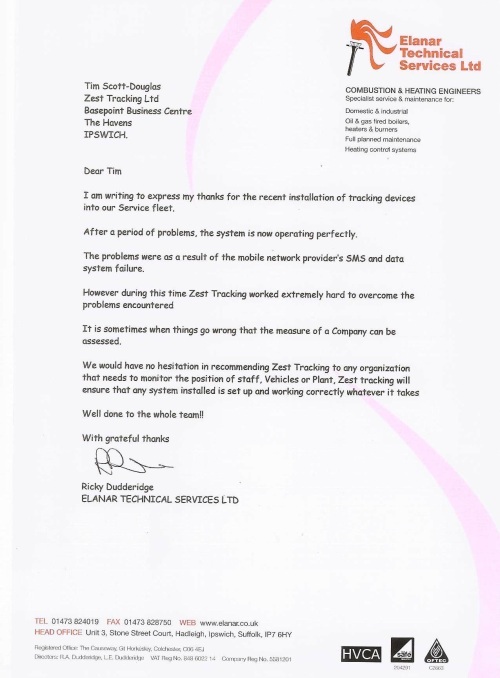 We have dealt with Zest Tracking Ltd of Woodbridge for some years. ​with the equipping of our Central Tyres fleet nationwide. This involved upward of 100 vehicles and 30 depots. Zest dealt with all of the installations, liaising with all the depot managers and company management effortlessly and seamlessly. The system that they offered is maintained by Quartix, who are one of the most respected and trusted GPS tracking providers in the UK and beyond. The management and depot managers now have 24/7 immediate access to all the vehicles throughout the fleet and their historic data. Due to the nature of our business response times are vital to our success. We are able to pinpoint specific vehicles and offer our customers the most concise up to date information at any time. Our focus is on providing the most effective and cost sensitive solution to our customers and Zest Tracking Limited in collaboration with Quartix are able to afford us this business critical option. We can monitor our drivers, their driving behaviour, the effect this has on our vehicle maintenance costs and also important issues such as our carbon footprint, which as a company we are trying to reduce in compliance with Industry guidelines. We have absolutely no qualms in recommending Zest Tracking Limited and do so with the greatest of pleasure. They have treated us with the upmost regard and made doing business a pleasure. 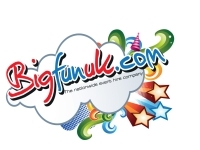 They have handled everything from initial point of sale through to conclusion and given us the personal service that is so lacking within large organisations. Zest introduced me to the concept of Vehicle tracking and Quartix. I have found that I am already in the habit of accessing the vehicle tracking website immediately I start up my computer and can have a look at the previous days summaries and driving styles. I often use the live viewing and find the daily summary option very comprehensive. Together these options allow me to identify exact times and durations that my engineers have spent at any one project to ensure I can offer the most competitive price to our customers without the potential of underselling our services. Mark Shelley, one of the directors of Shirley Shelley Contract Cleaners says, 'One of the most concerning areas of our business is productivity, ensuring our vehicles are where they should be, when they should be. We decided to review the telematics market for options, paying particular attention to the crucial issues of price, capability and level of service provided. Following research into a number of tracking systems'. He confidently chose the solution offered by Zest Tracking Ltd. Outlining some of the cost benefits of the system, he states that the company is making considerable savings in terms of private use of vehicles. "It results in cost savings and deters against out-of-hours use. Our operatives are aware that we know the speeds at which they travel, affording us a significant reduction in our annual operational costs. With astute attention to customer service, Mr Shelley states, "We're proud of the diligent service provided to our clients and the good relationships maintained with them, so the tracking logs can be interrogated to establish the length of time that an operative has spent at any specific job and whether this is sufficient for the job to have been completed thoroughly. We treat every assignment as having equal importance, whether it is a single call or a national contract." "One of the added benefits of the tracking technology is increased productivity," Mark adds, "If the logs show that an employee is regularly finishing a scheduled three-hour job – to the required standard – in two hours, then it's our cue to reduce the operative's hours and thus save costs. Also, because employees are aware of the tracking facility, they get through their assignments with minimum time wasted." Shirley Shelley positively encourages communication between client and company and Mark explains that the tracking facility enables faster response to customer enquiries. We chose Zest because they are a local company, able to offer a deal more competitive than the big players in the markets. In addition if a problem arises I am able to speak with someone immediately and feel confident that the problem will be resolved as soon as humanly possible. Modern technology with old fashioned service!